Hannah Cummins 1828 [W6525] - $14.00 : Yarn Tree, Your wholesale source for cross stitch supplies. 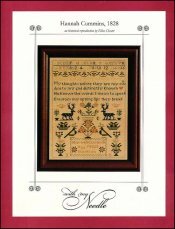 Cross stitch pattern by With My Needle. This sampler has some oddities and irregularities that make it unique. As you look at this design, you will find that the word, "My" in the first line is stitched higher than the rest of the line. The end of the first line and the end of the third line of the verse run into the border. At the top of the design, the alphabet is stitched along with the numbers 1-16. Below the alphabet is a strawberry band. Below the strawberry band, a saying is stitched. Wildlife & flowers are stitched below the saying. This is "Hannah Cummins, 1828." Stitch counts is 168W x 241H.